Spokesperson: "We're not ready to discuss release timelines currently"
Earlier this week Unity Technologies confirmed that its engine will support the New Nintendo 3DS, which could lead to a variety of interesting developments - the eShop could receive more ports exclusive to the New hardware, and it also serves as another area in which the Wii U and latest portable share common ground. Since its announcement in Japan, however, both Nintendo and Unity have been rather quiet, with a press release issued that announced the move but, essentially, it revealed very little. We contacted Nintendo and Unity Technologies shortly after the announcement - Nintendo simply directed us to the original press release. Unity has come back to three simple questions that we asked, with the spokesperson's replies suggesting that, though this support is confirmed, further news is being kept under wraps. Is there a timeframe for this support to be active? - We're not ready to discuss release timelines currently. Will this utilise the latest version (5.1) of the engine? - New Nintendo 3DS will be part of the most recent version of Unity at the time of release. Are there any plans regarding the original Nintendo 3DS models? - Only support for the New Nintendo 3DS was announced. The only notable take-away from that is that New Nintendo 3DS support will be integrated into the latest build of Unity, currently iterating through version 5. It's possible to have multiple versions of Unity installed at once, and in the past there could be discrepancies in which iterations would support porting to individual systems. It seems that the company has improved matters in its latest build, keeping everything simple and within one setup - that was reflected in the press release earlier in the week, which simply referenced a 'Unity platform'. It's a little odd that the announcement was made without so much as a release window for this compatibility to be available. That doesn't mean it's a long way off, as it's possible that Nintendo and Unity are saving up an announcement to be timed for a certain level of impact, though it could also mean that a release period still hasn't been determined by the companies. The influx of Unity experiences on the New Nintendo 3DS is likely coming - we just don't know when. I'm more curious of what type of projects will come of this! Here's hoping to some awesome games! This might also be a sign that the New 3ds is here to stay for a few years. I kinda hope it does. 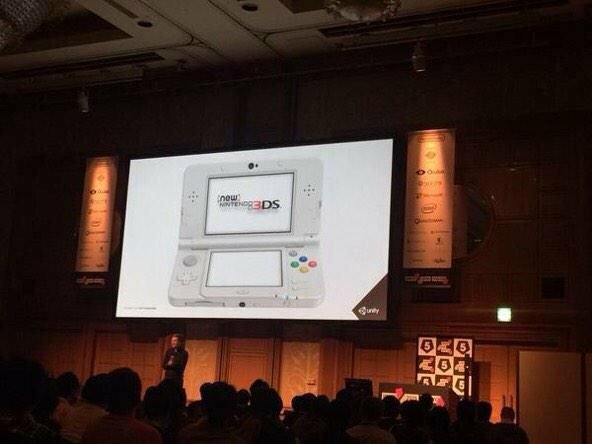 The new 3ds is likely to be compared to the dsi. It came at the end of the cycle, introduced a few exclusive features and became the flagship model of the ds range. Of course i could be completely wrong. I'm hoping for the possibility of a wii u game or 2 to be ported that could be possible like super mario 3d world but they would probably have to change multiplayer to be connectable with only people locally but here's to hoping to many new game additions. Compared to the Wii U the 3DS could definitely use some more quality indie games on the E-Shop. Hopefully developers will flock to the New 3DS thanks to the addition of the latest version of Unity. Well, I'm hoping to get my game out for Wii U, maybe a 3DS release is also on the cards? @Dpishere really? I think Shovel Knight, Shantea, and Steamworld Dig would like a word with you. I can go on if you'd like. There is no less then 20 excellent eshop games and another 30 that are really good. If anything the 3ds has more quality eshop games then the U. @faint Yeah, at best it would be 3d Land 2. A pedantic point, but why does this site employ the word utilize/utilise instead of use? Editor Nerd complaint. I....thought that would be a given. Of course barely any of the features will be supported for 3DS, but anyway...shouldn't be too surprising that it's the latest version. As far as I know, Unity is extremely scalable. I'm assuming it can be used to develop games for smartphones from 2008 (like the T-Mobile G1) or 2009, so it shouldn't be too much of a stretch to support New 3DS. @Spoony_Tech All of those you mentioned are also on Wii U, though I get your point. It seems like more of the ones that I am interested in are coming to Wii U and not the 3DS. Games like A.N.N.E. and Steam World Heist haven't yet been announced for 3DS, though I sure hope they are at some point. @Dpishere I'm almost positive Hiest has been confirmed. I even seen the dev post a vid on Miiverse. I also get what you're saying as the game differ quite a bit. @AVahne It was scalable to the Wii. Of course it would be on New 3DS. Am I the only one who doesn't know what Unity is what what its even going to do? @Tsuzura Its an engine that most indie(and some AAA) devs use to make their games. Every platform known to man currently supports but the 3DS. This announcement basically means more a lot games for the eshop. No, its stronger than the Wii. So it can handle better overhead just fine. @CrimSkies97 How exactly three cores of simple ARM11 at 266 mhz are "stronger" than a PPC750 core at 730 mhz? Even not counting any vector units the stationary CPU trumps the ARM. Not sure about the GPU (because there's frankly no data about it to analyze), but even so - I don't know what are you building your assumptions on, and no games so far support what you said. You really need to read up on what the ARM11 MPcore can do. And you really need to drop the Mhz myth while you're at it as that'll only give you a ballpark estimate for CPUs in the same family let alone unrelated ones. Not only is the ARM11 MPcore newer and uses more modern technology for better efficiency, but it also has: more transistors, more/faster cache, faster bus( wider bit bus), OoO completion, smaller nm, Thumb2, multi-core, 4-core VPF, etc. Many, many other superiorities over the ancient PPC in the GCN/Wii. The clockspeed might be a bottleneck but, for the N3DS, thats where the additional cores comes in. And all this is not even mentioning that developers stated the N3DS received a single-threading speed boost over the old 3DS making the speed it processes linear code even faster than it already was. As for the GPU, that has already been confirmed by devs to be, for the screen size, superior to the Wii's, sporting more modern shaders and lighting. RE:R demonstrates the graphical capabilities while Ironfall, while sporting better graphics, also display up to 40 enemies on screen at a time while maintaining framerate(stated by the devs), smoke/particle/water effects, and explosions all within huge maps. And this is OLD 3DS software. Certainly blows the GCN out of the water. I'm glad it's coming to the new 3ds. At last it's easier to justify buying it. Perhaps this has something to do with Nintendo's foray into smartphones? Not likely, but still cool. yup the 3DS and Wii U have power, it just doesn't look that way because not that many developers take advantage of the 3DS/Wii U capabilities. Seriously everyone needs to play resident evil revelations or IronFall on the 3DS and then they will know what we're talking about. But regarding the headline, why utilise the word utilise when you can use the word use? I much prefer words of one syllable even if they sound less 'high-falutin'. I expect it's the same deal as with Unity 5 for WiiU - it'll come when it's ready, not on some arbitrary schedule. Alternatively, it may be they choose some trusted devs to do a test run with the new tech before opening it up to the wider group of devs (still within the existing 3DS dev program). In which case, we'll probably just see the odd one or two unity-nn3ds games at first, rather than an opening of the flood gates. Do we really know what New 3DS can and can't handle yet? Will Nintendo let us make games based on there characters?because I want to make a paper Mario fan made. I do not care what game engine was made or used for any game. It could be Flash or Game Factory for all I care folks. Even RPG maker has tons of non-RPG games as well. In the case of Star Fox 64 and Zelda, I only care after I have played the game and enjoy it. Not purchase an game and was disjointed with lies. Nothing to look forward to!!! Maybe I will be able to release some of the games I am working on. Say hello to a stream of casual games like Meme Run 2: The Unityfication. Well, "use" is part of what is called spoken English. For writing, "utilize" should er.. be utilized. So where are the announced games for it? Geez, E3 is way too far away to wait to reveal games for this thing.